An anchor from the MAINE in Reading, PA (photo from Richard A. Sauers, Pennsylvania in the Spanish American War, Harrisburg: Pennsylvania Capitol Preservtaion Committee, 1998, p 42.) We have learned from Félix Alfonso Peña that the anchor is now located at d on the western edge of Reading's City Park, on the first block of North 11th Street. One of MAINE's 10" turret sighting hoods is located at a newly built War Memorial located on the western portion of Ket West known as Mallory Square. It was formerly located at the Key West Post Office. Newell Rising was a coal passer aboard the MAINE and did not survive the explosion. 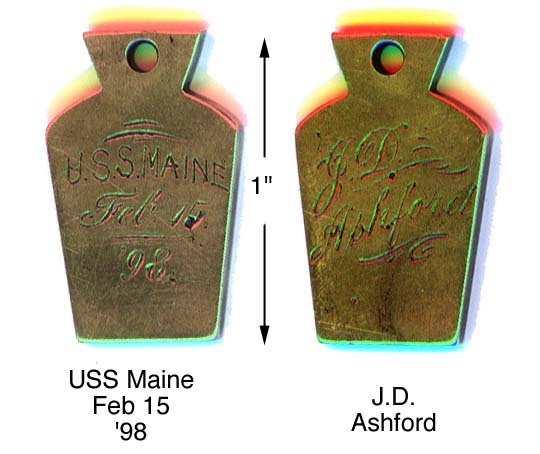 For more MAINE artifacts, click here!